Nucleon BI Web (Business Intelligence for the Web) is a powerful, modern and innovative business intelligence, data reporting, data visualization, data mining and data analysis software for the web. Using Nucleon BI Web, you can easily connect to any data source and visualize BI app projects. Nucleon BI Web is part of Nucleon BI platform. It provides core data visualization modules and components. Nucleon BI Web is a Microsoft IIS/ASP.Net based web application which uses MS SQL Server database and IIS, specially designed to build web-based BI applications and services. Nucleon BI Web can only visualize the BI app projects on the web. It doesn’t provide any designer or configuration tool for BI items. Using BI Studio, you can create, edit and design BI App projects and BI items. After creating a BI App project, you can publish the BI App on the BI Web portal and visualize the components. Nucleon BI Web supports MongoDB, NuoDB, Oracle, IBM DB2, IBM Informix, IBM Netezza, Ingres, SQL Server, SQL Azure, MySQL, PostgreSQL, FireBird, SQLite, ESRI GeoDB, Apache Hive, OData, MS Access, MS FoxPro, dBASE, REST, Xml, Json, SharePoint and EffiProz data sources. Nucleon BI can connect to any database system via OData, ODBC and OleDB technologies. BI Web views dashboards within BI app components like reports, charts, table, image, text, pivot tables, flat tables, web contents. 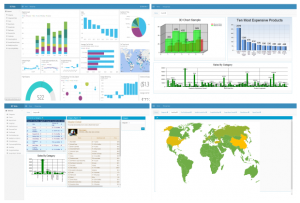 BI Studio provides a dashboard designer and components to create BI dashboards. BI Web allows you to view and export reports with data, charts, data grids and pivot tables on the web. It can view desktop designed reports on the web and can execute with parameters. It supports all MS Office products and the reports can be exported to MS Excel, MS Word, MS PowerPoint, Open Office, PDF, XPS, XML, HTML, CSV, JPEG, GIF, PNG file formats. BI Web support charts and can visualize 2D and 3D charts and allows you to export chart as an image. It allows you to export chart any MS Office and pdf file formats. BI Web provides Pivot Table (OLAP) feature for cross-tab data analysis. The OLAP module provides MS Excel-like pivot table for multi-dimensional data analysis and cross-tab report generation. Bi Web can visualize the query results as a flat data table with dynamic parameters. BI Web provides rich data export features and supports all Microsoft Office file formats. It allows you to export data in most popular file formats: XML, HTML, CSV, MS Excel, Ms Word and MS PowerPoint, OpenOffice Calc and Writer, RTF, PDF, XPS, JSON, dBASE and PNG. BI Web supports REST API for all BI components. It can visualize and export the component results in PDF or Excel file formats. Please contact our support team for online demo login information and for the web application setup. Using online demo you can see the BI Web on the action and features. Data Export: XML, CSV, HTML, MS Excel, MS Word, OpenOffice, PDF, XPS, JSON etc. Data Sources: Supports all BI Studio data sources.